Porcelain dental veneers turn discolored or uneven teeth into a brilliant, confident smile and some of the best dental veneers San Diego & La Jolla has available are from Dr. Richard Feinberg. Looking for some of the best dental crowns San Diego has to offer? Look no further than Dr. Richard Feinberg. Where a tooth is cosmetically damaged but still healthy, a dental crown is an ideal solution. Dr. Richard Feinberg is widely considered one of the best dentist San Diego & La Jolla has practicing and is renowned as a dental crown & veneers expert. With over 36 years of experience, he is a member of the American Dental Association, California Dental Association, International Congress of Oral Implantologists, and is a Fellow of the Academy of General Dentistry. He established his La Mesa dental practice in 2001 where he has focused on comfortable and state-of-the-art aesthetic dentistry, from the replacement of one tooth to entire oral rehabilitations. Over the past 15+ years Dr. Feinberg has been a leader in the newest, safest and best procedures for cosmetic dentistry, specifically becoming the dental crowns & dental veneers expert San Diego trusts most to deliver confident smiles to thousands of patients. 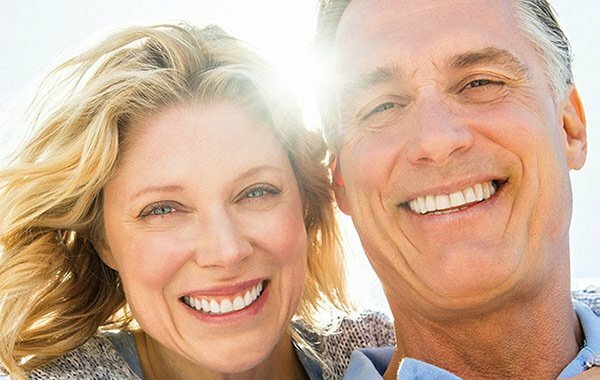 Presently, Dr. Feinberg continues his work as the best dentist San Diego & La Jolla has available as a crowns & veneers expert as well as offering the full array of dental health services, from dental implants and dentures to all forms of cosmetic and general dentistry. Dr. Feinberg and his whole team take tremendous pride in each and every smile of each and every patient. Customer care and service are at the very core of the goals of his San Diego Dental Center. A dental veneer is a thin crafted shell designed to sit on top of a properly prepared tooth. Once customized veneers are created, they are specially bonded to the front of teeth. A primary benefit to dental veneers is that unlike natural tooth tissue, which can become discolored by tobacco, wine, soda, coffee, and other dark beverages, veneers resist staining. This allows even the most discolored teeth to become pearly white. With Dr. Feinberg, your new dental veneers are color matched to your mouth to ensure the most natural look. Choosing the right dentist to perform your dental veneer procedure is the most important decision you will make. Far too many times we’ve seen poor veneer work done by an inexperienced dentist. The veneers don’t fit the mouth. It looks uncomfortable and unnatural. The reason one gets dental veneers is to have a brilliant and confident smile. Dr. Richard Feinberg is an experienced prosthodontist, having received advanced training in the use of dental veneers and other cosmetic dental procedures and has performed thousands of procedures. Typically, the best dental veneers are created from a porcelain material that matches the natural appearance of white and healthy teeth. The veneers are custom created to fit the size and shape of your teeth and mouth, ensuring you have the smile you want and planned for. In many cases when a tooth is severely weakened, placing a dental crown can restore the structure and function of the affected tooth. Tooth decay, grinding teeth and dental trauma are just a couple of the problems that can create the need for a dental crown. 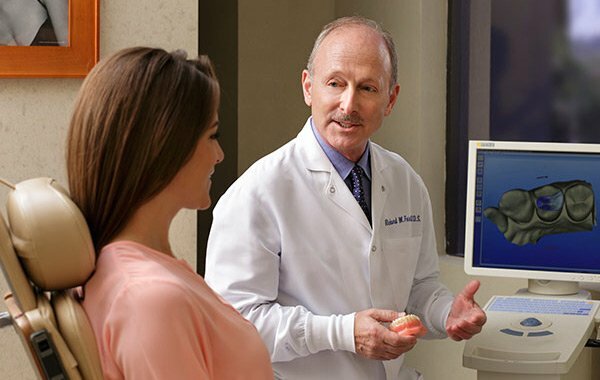 As an experienced prosthodontist, Dr. Richard Feinberg is the specialist for dental crowns San Diego has trusted for decades. A dental crown is placed on top of a properly prepared tooth and cemented in place to be permanent fixture. The crown works as a cap that fully encases the entire existing tooth, from your gum line to the top of the tooth. A dental crown can be a far preferable procedure than full tooth extraction and dental implant. In many cases a tooth is cosmetically damaged but still healthy enough for a crown, which is an ideal cosmetic and structural solution. As with any cosmetic dental procedure, before a crown is installed, a full general dental examination is recommended as the first step, with any gum disease treatment, cavity repair and mercury/amalgam removal being included in the treatment plan. Typically, receiving a dental crown takes two or three visits, sometimes more. However, Dr. Feinberg provides the best same day crowns San Diego has available. Not all procedures can be completed same day, but many can. Schedule a consultation today to discover if you are a candidate for a same day dental crown. "Every time I have been to this office, All the staff has been absolutely skilled, but also warm and sweet. Artists really. Crazy good dentist skills. I love them and look forward to coming back!" - Mateo S.
“The BEST dentist I've ever had! I've been to many different dentists in my 52 years without much success. From my first visit here, the staff made me feel like I was at home and part of the family." —Mark C.
“A friend said he was the best San Diego dentist around and its true! I have seen so many dentists in my life. But none like Dr Richard Feinberg. I felt at ease and relieved with no anxiety.” —Alicia C.
“From the first greeting as we came in the door to the refreshing beverage as I left, everyone treated us like old friends and cared as if we were members of the family. I almost forget I was at the dentist." —Cynthia H.
“It's the first dentist I like! They're knowledgeable, friendly, & accommodating. Blankets when I'm cold, headphones with music so I don't hear the drill. This is the best dental office you can go too." - Amber C.
“My front tooth dental crown came off and I searched the net for the best dentist in San Diego. I was greeted with very friendly, happy people. Thank you so much for quality service & affordability." -Chanc L.
“The BEST Dentist I've had the pleasure to encounter. An exceptional professional and a great person. Dr. Feinberg and his super competent staff provide EXCELLENT service." -Martha B.
Dr. Richard Feinberg has been servicing the greater San Diego area and beyond for over 36 years, performing an array of general and cosmetic dental services, specifically dental crowns and porcelain veneers, for adults, teens who have a mishap and many more. Additionally, Dr. Feinberg has been honored to be able to service the men and women of our military and countless veterans who uniformly find his practice one of the best. Conveniently located in La Mesa, Dr. Feinberg’s San Diego Dental Center is easy to get to for residents of San Diego proper and all the surrounding communities and is the one place patients can go for the best dental veneers San Diego has to offer as well as a full array of other cosmetic and general dental services and procedures.